Department of Management Studies, Master of Financial Management programme organized a Guest Talk on "Monetary Policy" on Monday 23rd June 2014, from 10.00AM to 11.30AM at Room No.C911, Central block 9th Floor. The resource person was Dr. Michael Debabrata Patra, the Principal Advisor, Monetary Policy department, Reserve Bank of India, Mumbai. Dr.Patra addressed the audience on monetary policy framework and challenges ahead in the present context of global economy. Perhaps the mundane daily grind does not let us realise the nuts and bolts in our body. Perhaps we need a 10 Km Run to listen to the complaints of our physical self. 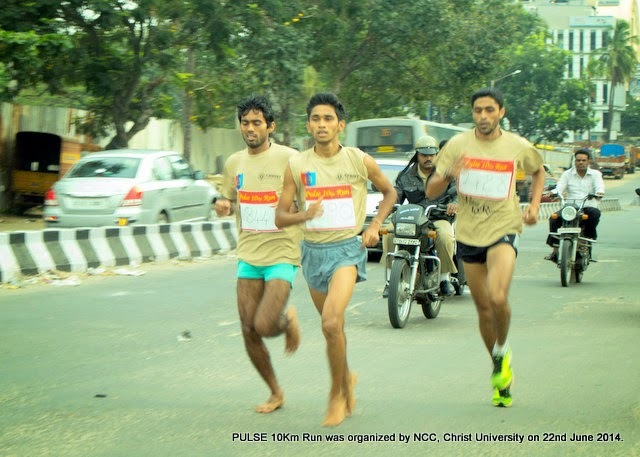 Perhaps, fresher’s need to run 10 kms to realise that famous adage, “pain is inevitable and suffering is optional.” With more than 500 first time runners, Pulse 10 km Run organised by the No. 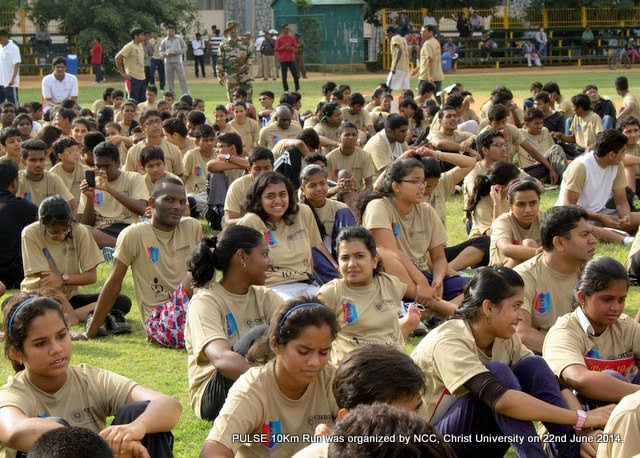 2 Coy, 9 Karnataka Battalion NCC of Christ University spread across the significance of Health and Fitness. 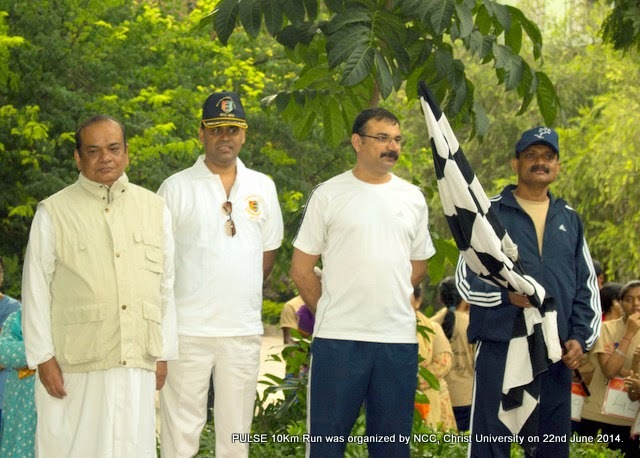 Following a rousing reception, Honorary Col Dr Fr Thomas C Mathew, the Vice Chancellor of Christ University greeted the participants and encouraged the 2/9 Coy NCC to keep the spirit of health and fitness high. Col Biju M. Thomas, the Group Commander of Bangalore Group 'B' NCC flagged of the event at 6:30 am sharp. Within a span of 30 minutes and 22 seconds, as though they were sprinting 10,000 metres, two participants had finished the race! 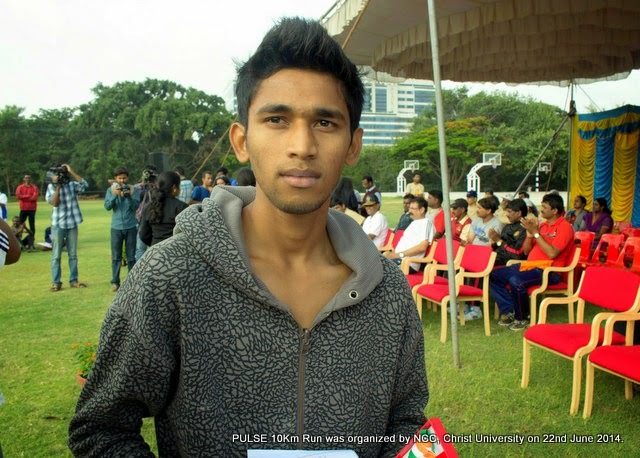 The difference between the first prize winner Praveen Khambal and the next-in-line Manoj Kumar was just a second. 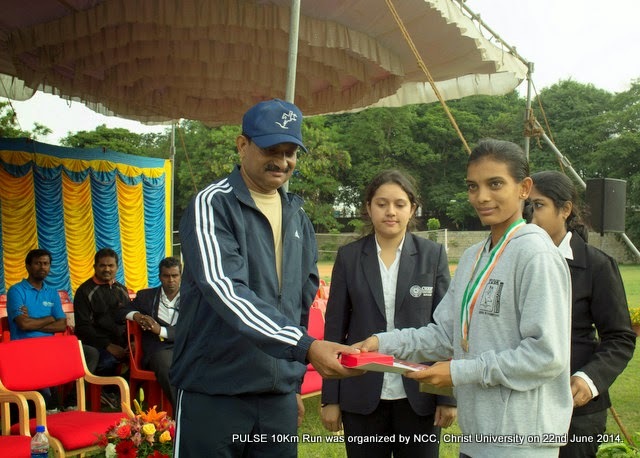 In the women's category, Poornima R and Sahana H D finished first and second respectively. 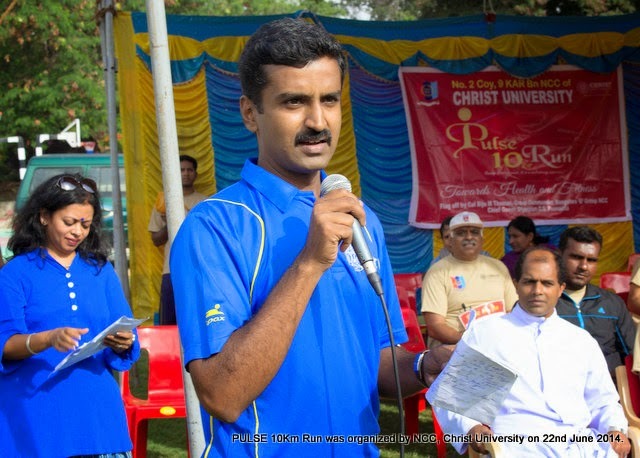 Olympian C S Poonacha, the chief guest of the event, congratulated Christ University's 2/9 Coy for initiating such a noble venture, and encouraged the 750 participants to attend to health and fitness even more vigorously. Col Narendra Shukla, Commanding Officer of 9 Karnataka Battalion NCC observed that he was impressed with the delightful compositional mix of the participants- the young and old, Africans and Koreans, faculty and students, etc. 68-year-old Balakrishna, the winner of the Senior Division Category stood out for the passion and commitment he showcased. 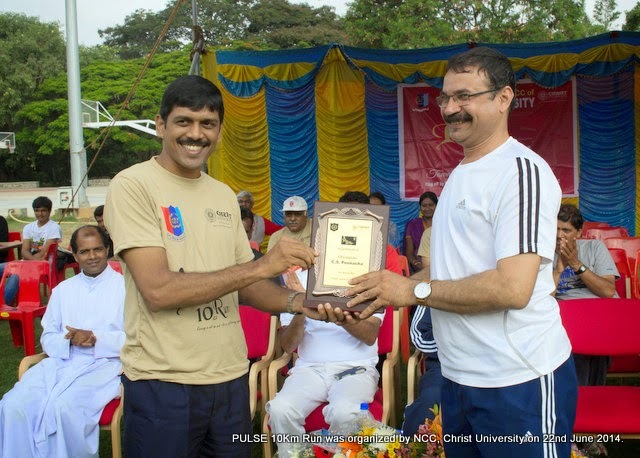 The university's Registrar Dr. Anil Pinto remarked that it was a commendable effort on the part of Prof Padmakumar and Prof Sajina for having led the well-knit 2/9 Coy NCC cadets and ensured that Pulse 10 km Run was a grand success. The Department of Psychology organized a two-day workshop on “Transforming your life story through the Expressive Arts on June 11 & 12, 2014. The participants consisted of faculty members, counselors, practitioners, postgraduate and undergraduate students.The workshop was facilitated by Kate T. Donohue, Ph.D. – licensed psychologist ,registered expressive arts therapist, international educator and trainer and founding core faculty member of the CIIS Expressive Arts Therapy Department. With her expressive arts compatriots, she has helped establish the International Expressive Arts Therapy Association and has co-created their professional standards and ethics code. On day one, the experiential tone for the workshop was set through various group activities that had participants explore the meaning and story behind their names and articulate how they felt about it through a significant personal gesture. Ground rules were articulated by the facilitator in terms of enabling participants to not only explore their life stories but also co-create the stories of those around them ; allowing roles to be flexible to facilitate transformation; and to empathize with others with whom one shares a similar story but respecting their privacy as well. A wide range of expressive arts were discussed such as drama/theatre, dance, music, imaginal language arts, visual arts and multi-arts and the facilitator encouraged the participants to narrate their personal story through their chosen art form. Participants were given the opportunity to also depict as drawings their childhood , adulthood, self-perceptions and transformative emotions that were evoked through dance, music and theatre. Through this participants explored layered meanings in their personal stories, identified their personal myths, used metaphor and imagery to narrate their stories and the obstacles that probably distorted their views of themselves. Through an experiential process of conscious mindfulness as well as exploring the unconscious or subconscious through active imagination, the participants were encouraged to experience the ‘healing’ and ‘therapeutic’ power of story-telling. A similar process was followed on day two where participants worked in either pairs or small groups to facilitate further exploration of how their personal life stories were being transformed.The highlight of the workshop was perhaps the dramatic enactments where story telling became a communal event as participants took turns in narrating their stories and other participants were not merely an audience but played an active role in weaving new stories. This meaningful activity not only helped portray the transformative journey of the participants over the past two days but also served the purpose of catharsis, encouraging empathy , insight, spontaneity and co-creation. Overall this workshop emphasized the role of both the unconscious and conscious psyche in the personal myths and fables we create and allowed all the participants to find their niche in the gamut of expressive arts. Further the groupwork permitted sharing of experiences without fear or inhibition. Participants perhaps concluded the workshop with enhanced optimism and personal control over their lives and the perceived ‘power’ to continue to transform their lives through their chosen expressive art. Christ University Faculty of Engineering Dept. 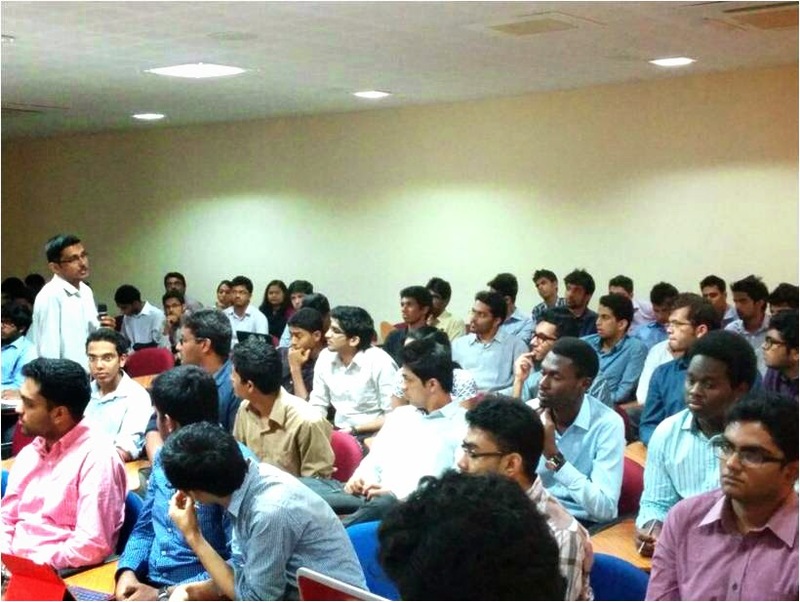 of CSE/IT, Kengeri campus, witnessed an awe-inspiring technical talk followed by a hands on session. 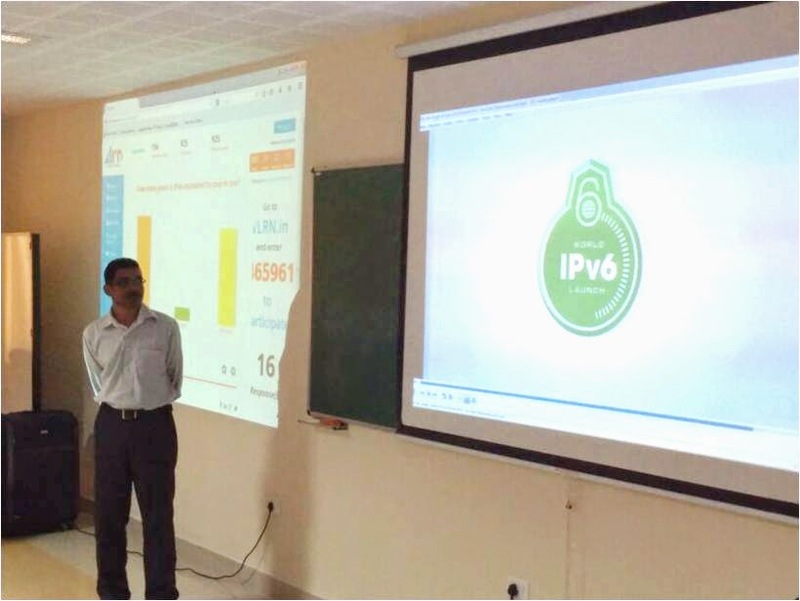 A team led by Baldev Krish from ‘128 Bits’ Bangalore (an A2B2 IT Services venture) gave useful insights on to issues related to IPv4 and the need for migration in to IPv6 technology on all the domains. The lab session conducted by the team was also very useful for the students especially logging into cisco routers, assigning hostnames and checking the connectivity between two router both in IPv4 and in IPv6. The students of ECE, CSE and IT from both BTech and MTech attended the technical session led by teacher in charges from 9:00 AM to 1:00 PM in seminar hall, II Block. Prof. Balachandran Head of the Department CSE/IT presented mementos for the team members as a token of respect and appreciation. The foundation of any academic programme is based on mutual trust, discipline and a passion for learning. The Honours in English Studies programme is no exception as it aims to develop an individual holistically, with a rigor for an interdisciplinary approach to social and intellectual concerns. As it is often said, education does not thrive in isolation, and neither does a class. With this understanding in mind, the orientation for the batch of 2015 began with a round of preliminary introductions that sought to give an insight into what everyone thought of themselves. Moving forward from the introductory session Prof. Padmakumar facilitated a series of ice breakers starting with trust falls that brought everyone out of their comfort zones, and taught us the valuable lesson that only when you fall, will you learn how to fly. The class was first split into groups of three to four to practise the technique of trust falls in order to avoid any needless mishaps. Throughout the practise sessions, Prof. Padmakumar was ever vigilant in rectifying our mistakes. A series of gasps and proclamations of appreciative delight later, we realised that the trust falls had only just begun. Whereas the practise sessions allowed the students to have their feet firmly planted on the ground, the second round required a leap of faith as the groups were further divided into two with each student relying on the other to guide them without depending on their own visual faculties. The guides would lead their partners across the dais, to step down and walk over to a chair, using which they would clamber onto the table, eyes still firmly shut. While this took place, four students would be waiting with their arms interlocked in a manner taught by Prof. Padmakumar, ready to catch the student as they fell backwards. As one can imagine, the exercise was met with hesitation and reluctance initially, but once the experience was complete, there was not a single student who didn’t find it rewarding. After a break, we had a briefing about the course where the students were given the opportunity to voice their expectations. Two activities followed, wherein the students were shown the difficulty of giving and receiving instructions, as they are intended. This reiterated the fact that education is an exchange between the student and the teacher. A small game was played which emphasized an age old success theory - smart work and an eye for detail will always triumph over mechanical hard work. 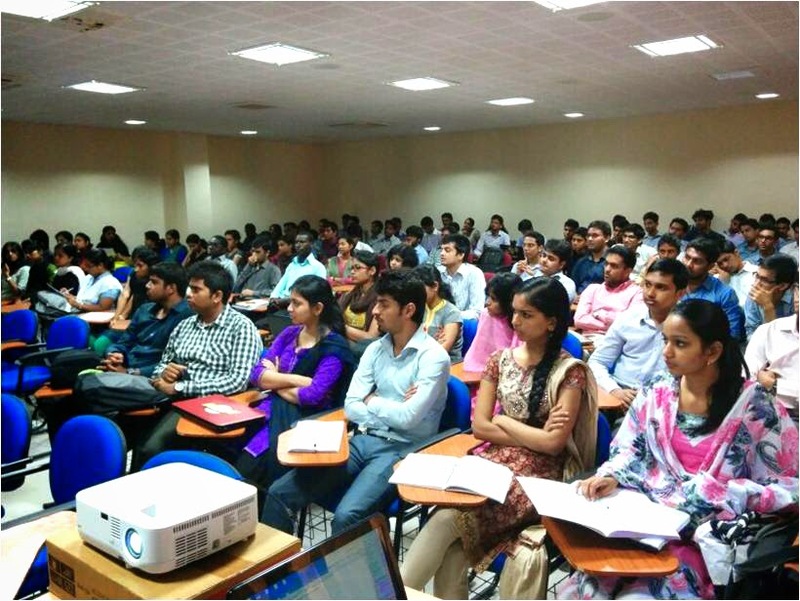 The orientation ended with basic guidelines and a class of students looking forward to studying their passion.